Multi-featured Personal Information Manager with high-security encryption, search engine, word processor, spellcheck, hyperlinks, bookmarks, agenda/calendar, recycler, Website generator, images, icons, and much more. Store all your notes, texts, etc. and keep them accessible, safe, encrypted, organized, searchable and always just a few mouse clicks away. Despite its obvious power, the program is fun and easy to use as well as small in size. 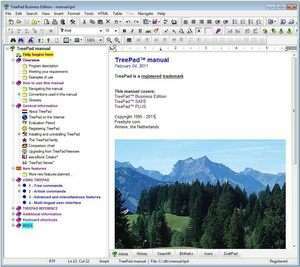 TreePad Business Edition 8.2.2 is a shareware program and can be used as a demo to try the software until the free trial period has ended. A full version of the program is available after the trial period ends. For security reasons, you should also check out the TreePad Business Edition download at LO4D.com which includes virus and malware tests. Additional screenshots of this application download may be available, too.